Volleyball can mirror life in many ways. There are moments of pure joy and others where we all fall short. Seventh year La Salle coach Tiare Tuitama and her program experienced both exhilarating successes and heartbreaking failures this season. That includes moments on and off the court. The 34-year old is an old-school, detail-orientated, intense type of leader. In today’s changing and more sensitive world, that demeanor isn’t always embraced by some parents and athletes. To her credit, she’d also be and was the first to acknowledge that mistakes were made along the way. Coach Tui, though, as she’s called by those who know her, took full responsibility for occasional missteps, and tried to become a better person and coach through challenging times. Her peers in the coaching world and the vast majority of her players, past and present love this woman as not just a coach, but as a person and mentor, as you’ll see below in the quotable section. Whether they won or lost matches, through the highs and lows, Tuitama always tried to learn lessons from all of those experiences, and tried to pass them along to her players. Coach Tui has a knack for getting La Salle to improve incrementally, so her Lancers are peaking towards the end of league and just before the CIF-SS playoff begin. Tuitama’s most impressive trait is how she’s able to lead the Lancers to higher levels after taking falls throughout the season. Each time they faced a setback, whether that was a nonleague tournament loss, or a CIF-SS Division 3 finals defeat, Tui was able to make adjustments and they came back stronger each time. Many thought after losing 3-1 to Sierra Canyon in the CIF-SS Division 3 finals would spell doom for the Lancers, but to her and mostly her player’s credit, they persevered and earned a spot in the CIF State Regional final, which the school had never accomplished. And despite losing to the eventual state champs again, Sierra Canyon, the second time around they forced the Trailblazers to a fifth and deciding set. To put that into its proper perspective, Sacred Heart Prep was swept by Sierra Canyon one week later in the state final. 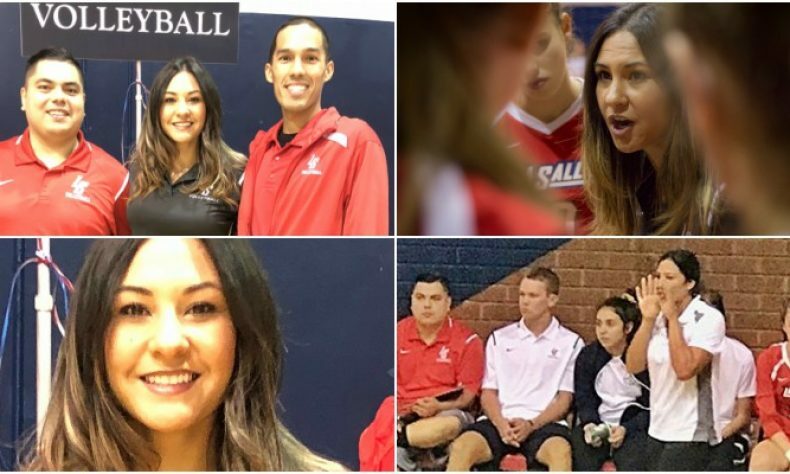 For her success, her ability to adjust to the changing times, and the love she has for the sport and the program, Tuitama has been named the 2017 Pasadena Sports Now Girls Volleyball Coach of the Year. La Salle (28-7) had more wins than any area program, despite trekking through an incredibly tough schedule along the way. The Lancers made the state regional finals for the first time in school history. They went 8-0 on their way to a Del Rey League championship, and won all 24 games within those 8 matches. In her 7 years at La Salle, the Lancers have won 5 league and two CIF-SS championships (2012, 2013). They’ve also been the runner up in the CIF-SS finals in both 2011 and 2017. Since 2011, La Salle is 171-72 overall, 47-5 in league matches, and most importantly, 21-9 in the CIF Southern Section playoffs. Tuitama is the older sister of Willie Tuitama, a former Heisman Trophy finalist while playing quarterback for the University of Arizona. Her brother is the offensive coordinator for Russell Gordon’s football program at La Salle, and she and her brother are extremely close. Tuitama experienced firsthand that old-school, tough-love kind of style back when she played at St. Mary’s High School in Stockton and at Cal State Los Angeles. While growing up, like most of us over 30, the old saying we heard was if a coach is yelling at you, it means they care and you matter. It’s when they stop showing passion towards you that should be concerning. As you’ll read below, her players say candidly that she can be hard nosed, but they also acknowledged they are better off for it, as both athletes and adapting to the harsh realities of life as a young person. Her parents both impacted her not only as a person, but as an athlete as well. Tiare’s mom, Nancy, was a setter at the University of Pacific, and her father, Lui played linebacker at Pacific. When asking about some of the hard times and those who weren’t exactly fans of her style, Tuitama took the high road and refused to bash anyone, especially not her players. With expectations so high, and rightfully so, Tuitama loves the challenge of maintaining the high bar of excellence, and she’ll never shy away from putting in the time or effort to keep La Salle as one of the area’s premier and perennial powers. At 34, and with the near universal support and respect she has among elite coaches and programs, Coach Tui’s impact on young athletes will last decades. She’s a consummate winner that any school or program would love to have, but for now, she is all about being a Lancer, and she couldn’t be more proud to be associated with a school as respected as La Salle. Lastly, though, she wanted to end this with a word to the parents of her players. La Salle girls volleyball record since Tuitama became the Lancers coach in 2011.